Welcome to Christensen Broadcasting, home of KLOH 1050 AM, KDWC 99.3FM, KISD 98.7 FM and KJOE 106.1 FM. We operate five studios in Pipestone, MN and Slayton, MN and service the tri-state area of southwest Minnesota, northwest Iowa and southeast South Dakota. Thank you to all of our Wheeler Dealer participants! We will be contacting the winners by phone or e-mail. Christensen Broadcasting is proud to announce the launch of KD Radio (KDWC), a new radio station dedicated to serving southwest Minnesota 24 hours a day, 7 days a week playing the best in Christian Contemporary music and inspirational programming. “This is an opportunity to bring positive and empowering messages to our listeners. We created this format with you in mind because we care. We care about your families, your faith and your well being. KD Radio programming will focus on motivating your lives and uplifting our communities.” says Wallace Christensen, owner of Christensen Broadcasting. KD Radio listeners will be able to access multicast programming on two frequencies, 99.3 FM and 106.1 HD3, as well as streaming online and via mobile app coming soon. Download our apps! Live Streaming directly to your device. Listen on your iPhone, iPad* or Android device! 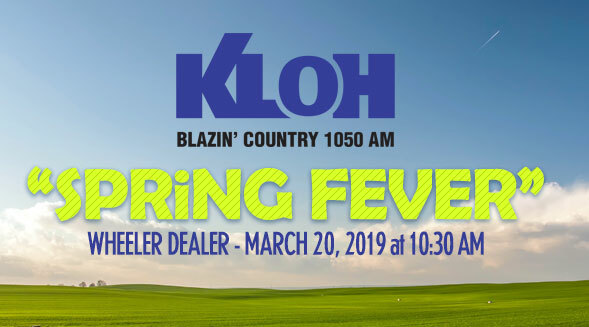 Wallace Christensen Broadcasting KLOH AM – KISD FM – KJOE FM Radio does not discriminate in sale of advertising on the basis of race or ethnicity. Effective March 14, 2011, any provision in any order or agreement for advertising that purports to discriminate on the basis of race or ethnicity is void.